The flood of responses and feedback by readers belie the lack of fanfare with which Abeng News magazine announced its presence on the worldwide web. The online weekly, an anthology of opinions, ideas and literary pieces, has emerged the bullhorn, as its name suggests, of the voices within the global Caribbean community. Editor Mark Lee, a Jamaican residing in Toronto, heads the production team at Abeng News, and anticipates growing interest in what was just a germ of an idea weeks before, now teeming with excitement at www.abengnews.com. The online forum was the perfect venue to network and exchange ideas on the regional homeland with others in the Caribbean Diaspora, and Mark Lee was an active participant. From analysing events as reported in the Jamaican and other national newspapers, to reminiscing on schooldays and the all-time favourite traditional eats, the dialogue continued for months among these displaced, knit together by a common interest in the happenings back home. As Lee looked around the talk/think-tank, he saw individuals who held strong opinions, some culled from a sea of letter-writers, a sprinkling of professional journalists from the print and electronic media and others just eager to dissect news, share views and discuss solutions. Lee’s communications and media background certainly equipped him to start the sound of Abeng News, a name originating from the cow horn used to summon enslaved Africans to their work in the sugar fields, and as a method of communication by the army of the Maroons, the shadowy rebel ex-slaves who had made their home in the mountainous interior of Jamaica. Mark Lee’s extensive involvement with Caribbean media allowed him to make his home at different periods in several islands from the Gleaner and the Western Mirror in his native Jamaica, to the Dominica Chronicle where he briefly sat in the editorial chair. Lee’s worked in broadcast journalism at Radio Jamaica, the former Jamaica Broadcasting Corporation, and Radio Antilles, Montserrat and in television as a freelance moderator at CBC Barbados and producing a women’s series for the Caribbean Broadcasting Union (CBU). He worked in news agency journalism with CANA, where he was responsible for the agency’s features output, developed speciality in tourism and traveled the region doing political and social coverage. He has also worked in corporate communication an public relations. Lee was employed in 1993 to re-establish the communication unit of the Caribbean Tourism Organization headquartered in Barbados, the agency responsible for guiding the research and marketing of the travel and tourism sector with a membership of more than 30 countries with borders on the Caribbean Sea. A book of some of his CANA reportage was published, as well as some poetry in journals and anthologies, and has edited works relating to governance in Caribbean integration. He also did some course development and teaching part-time at the College of Arts, Science and Technology (now the University of Technology) and the Jamaican Institute of Management. He was a member of the panel of judges for the regional Pan-American Health Organization Excellence in Health Journalism awards. 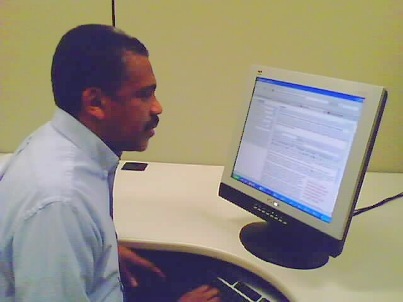 Lee migrated to Canada in 2002, and now works in the Communications and Public Affairs office of a major Ontario crown corporation, yet he still seeks to maintain his strong links to the Caribbean through informal online forums with friends and associates. Though the news magazine was launched with an outpouring of contributions from “forumites”, Abeng News now has contributors from the far reaches of the globe. Lee is flanked by two women, co-owners, and as they like to joke, co-conspirators. Raquel Ingram, PR/Communications specialist based in Toronto and freelance writer Kadene Porter in South Florida have helped shape the Abeng media (there is audio and video too), and their edgy submissions have been fodder for hearty and sometimes incendiary debate. The escapades and observations of that “Jamaican samurai” Rico Nembhard, on his legendary journey of the Orient, rivets the Caribbean dispersion, the desire to come back to centre and touch base with home on a weekly basis via the Abeng platform, while Afua Asantewaa and Maureen Rowe infuse their African eperiences into each report, from the delightful gastronomical experience to the colour and vibrancy of the marketplace. Others from the Caribbean, its global communities and even those only having an interest in the region, continue to enrich the intricate patterns within the mosaic. As the Abeng News readership grows, Lee’and his team of prolific writers have every reason to believe the growth can be sustained. “The forum helped rekindle the vision to satisfy the need for a financially viable Caribbean-centred outlet for considered views and opinions,” he said.